The year finally seems to have come to life with regards to Linux and this week saw the release of the latest long term support release of Linux Mint. I am glad that Linux Mint 18 has been released because it puts it back on a level playing field with Ubuntu with regards to kernel versions and software updates. 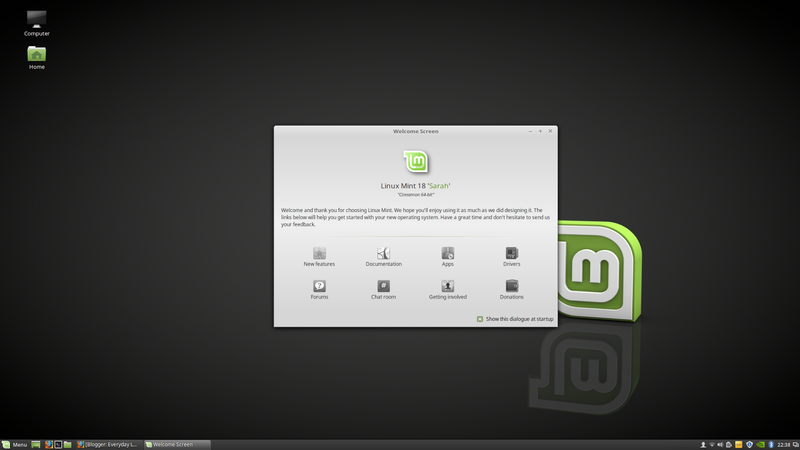 Read on to find out the new features and my experience with Linux Mint. I have started with the new features first. 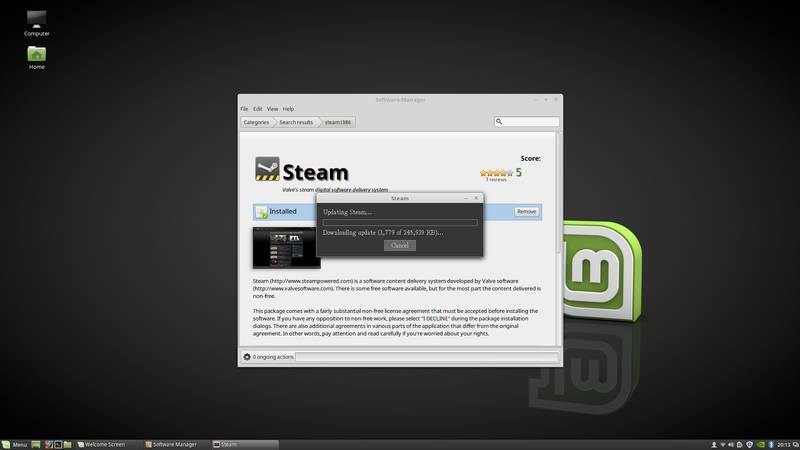 The main review and my experiences with Linux Mint are highlighted later in the article. Linux Mint 18 comes with the following new features. A video has been produced highlight the improvements to Cinnamon. There have been windows management improvements on tiling, mapping and unmapping windows. Windows can be snapped easily by dragging them into position. Favourites and system options can be disabled in the menu applet. 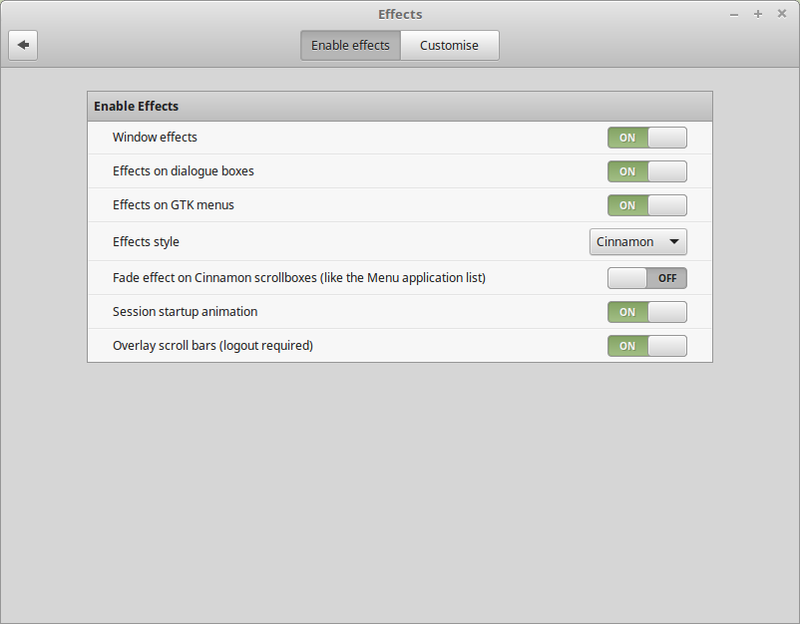 Animation effects are enabled by default on menus and dialogs. More options for selecting default applications for different file types. 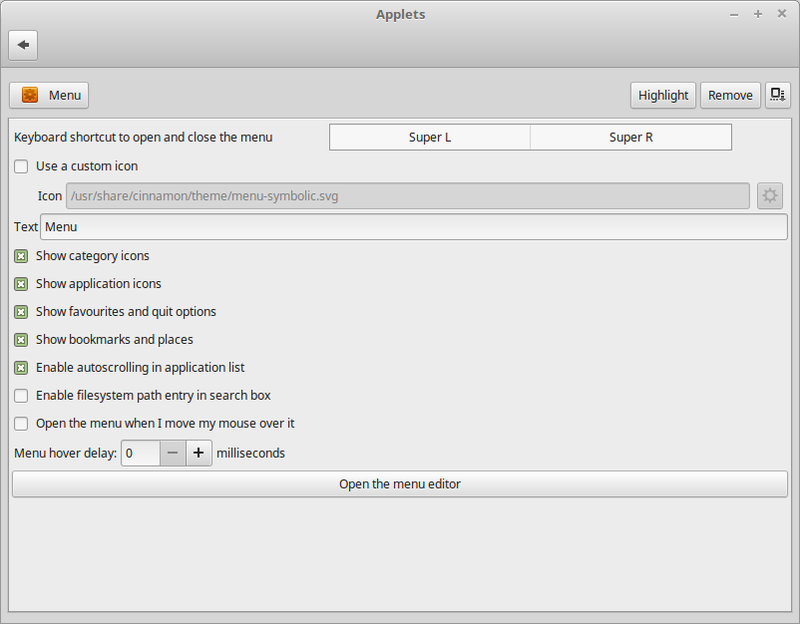 Panel launchers now give menu options for each item such as open in terminal. 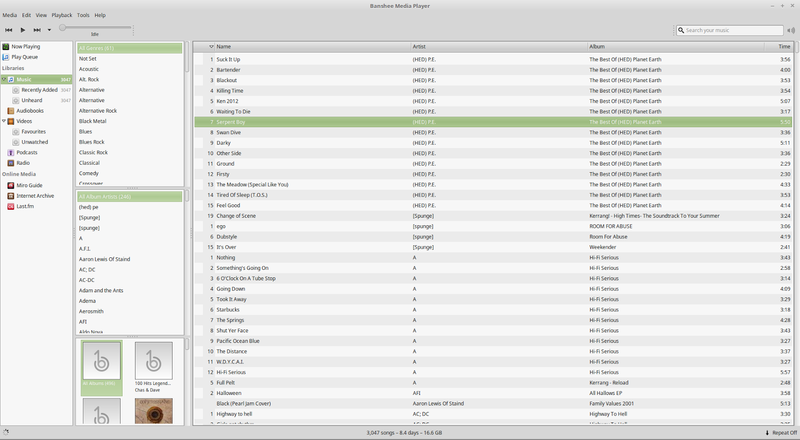 Improved support for Spotify 0.27, Viber and GTK 3.20. A new project has been created to make applications which currently do not work well except for in a specific environment work well on all environments. For example imagine application A was built for the GNOME desktop environment and it worked fine there but when implemented in other environments it looked quirky. X-Apps is designed to turn applications like application A into something that will work anywhere with familiar menus and toolbars etc. It is a nice idea if it works. Some applications which have been given the X-Apps treatment include Xed which is based on the Pluma text editor. There is also XViewer which is based on Eye Of Gnome. XPlayer is based on the Totem video player and Pix is based on GThumb. Improvements have been made to the update manager and a new theme called Mint-Y has been produced to make Mint look more modern. 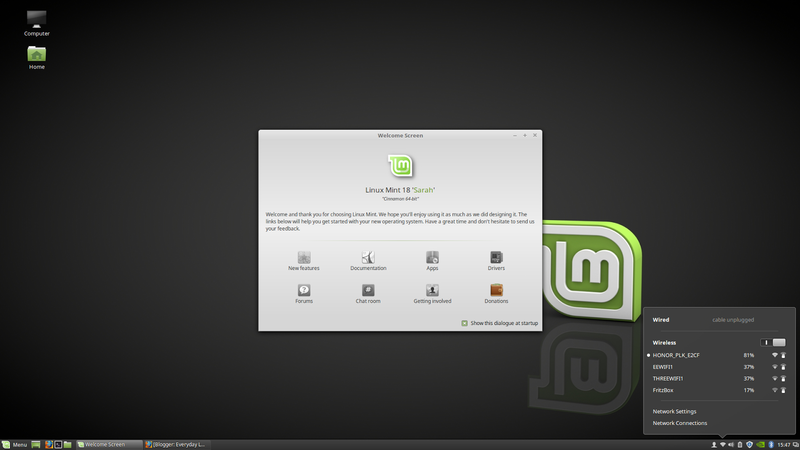 Linux Mint 18 is shipped with kernel version 4.4.0-21. This is much better for people with modern hardware. If you are looking for an installation guide then this one shows how to dual boot Linux Mint 18 with Windows 10. If you just want to create a Linux Mint 18 USB drive to try it out follow this guide. You can also buy a Linux Mint 18 USB drive. 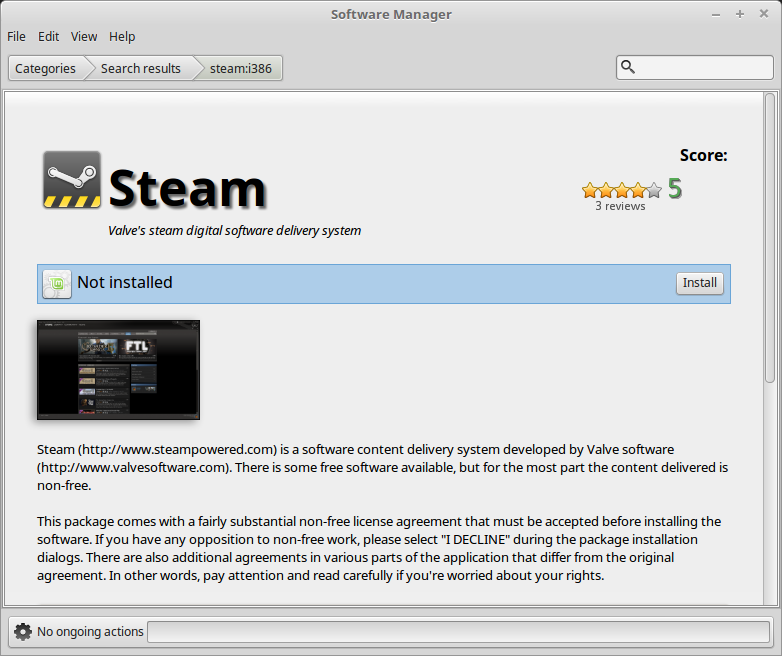 After downloading Linux Mint you should check the MD5 to make sure you have downloaded the correct version. Linux Mint 18 looks really very modern. When you first boot into the display screen you get a rotating background image before you log in. After logging in you are presented with a stylish dark background and a dark theme. 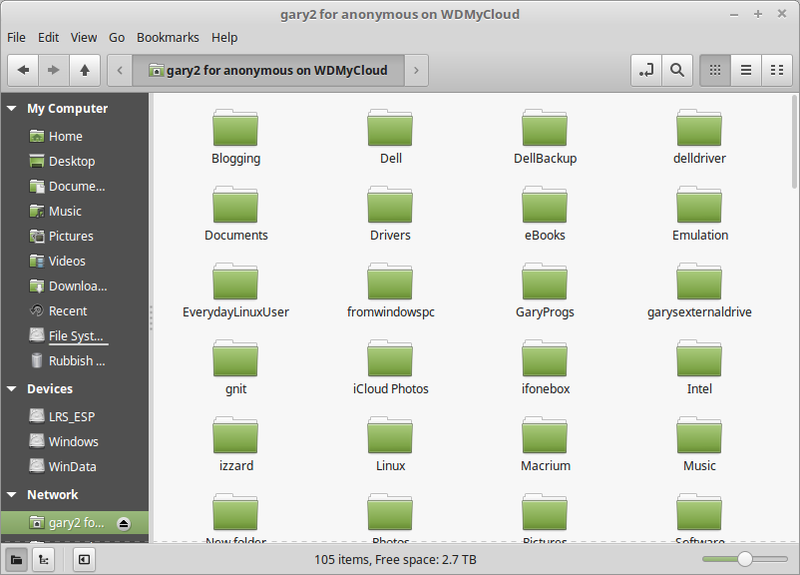 The general look and feel is the same as previous versions of Linux Mint with the Cinnamon desktop. There is a single panel at the bottom with a menu icon in the bottom left corner. The menu has a number of key items on the left side which let you log out, open a file manager, a terminal window and a browser. This is followed by a series of categories such as accessories, games, graphics, sound & video etc. When you click on a category the list of items in that category appear. You can also search for items using the search bar within the menu. Next to the menu icon on the panel are some quick launch icons which again provide instant access to a file manager, browser, terminal window and show desktop. In the bottom right corner there are panel items which let you connect to the internet, adjust audio settings, adjust power settings, bluetooth settings and there is also the clock. Next to the clock there is a little icon which when clicked will show all the open windows. For those of you completely new to Linux you will find Linux Mint very intuitive and there isn’t a big learning curve jumping from something like Windows to Linux. Unlike the Windows desktop however the Linux Mint desktop can easily be customised to look and feel the way you want it to be. 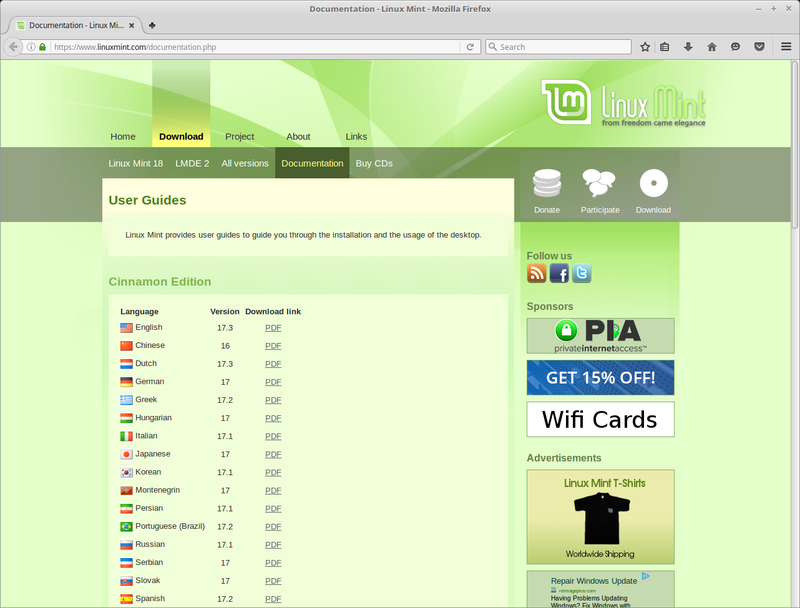 This guide will show you how to easily customise the Linux Mint Cinnamon desktop environment. For most people connecting to the internet will be as simple as clicking on the network icon in the bottom right corner. If you have an ethernet connection it will automatically connect you to the internet. If you need to connect to a wireless network you will see a list of available networks. When you click on a network you will be asked for the password. If you don’t see any networks to connect to and you think there should be one available then check the following things. Check that the wireless slider is set to on. Check that there isn’t a button on your laptop for turning on the WiFi. Read this guide which may help you troubleshoot WiFI issues. It is worth clicking on the “Additional Drivers” button on the welcome screen. If you have closed the welcome screen you can find it again by clicking on the menu icon and searching for “welcome” using the search bar. Alternatively you can get straight to the additional drivers screen by typing “driver manager” into the search box. You will see drivers for audio, graphics and WiFi if they are available. If the item says “not working” it is better not to use them. If however you see the word “recommended” next to an item you should choose the option and click “Apply Changes”. 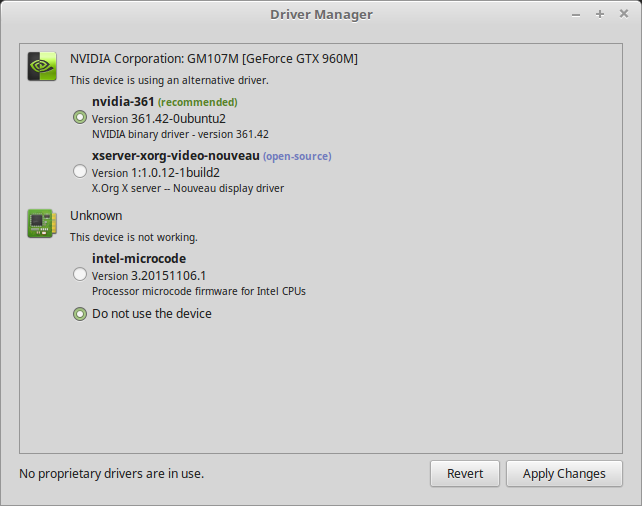 If you have an NVidia graphics card you will get much better performance by using the official NVidia drivers. Whilst the welcome screen is still open it is worth checking out the documentation option. You will see user guides for a good number of different languages. It is worth downloading the documentation for your language because it has some good instructions and keyboard shortcuts. Linux Mint comes with everything you will need to get you up and running. The LibreOffice suite comes pre-installed with a word processor, spreadsheet package, presentation tool, drawing package and database package. For listening to music there is the excellent Banshee audio player. With Banshee you can import your music that is local to your machine, download podcasts, import audiobooks, listen to online radio and watching videos. You can edit images with GIMP and view photos using XViewer which is the same as the Eye Of Gnome picture viewer but created as part of X-Apps. 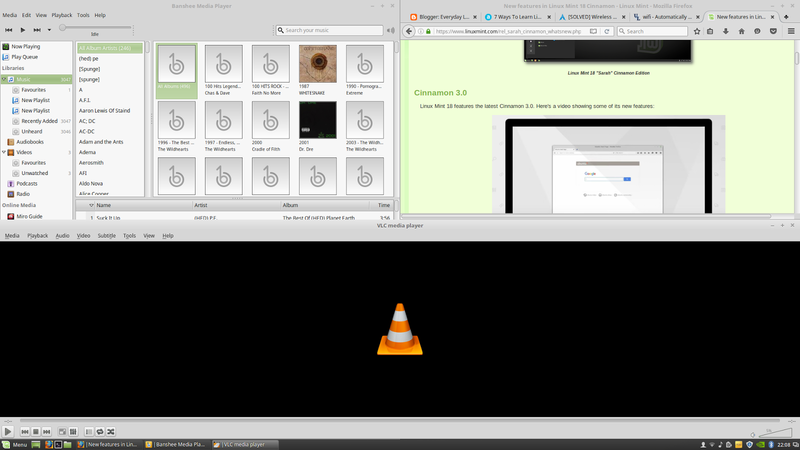 For watching videos you can use either VLC or XPlayer. The default web browser is Firefox and the mail client is Thunderbird. Other tools include a PDF viewer, note taking tool, CD/DVD writer, USB image writers, calculator, Bittorrent client, instant messenger and an IRC chat client. 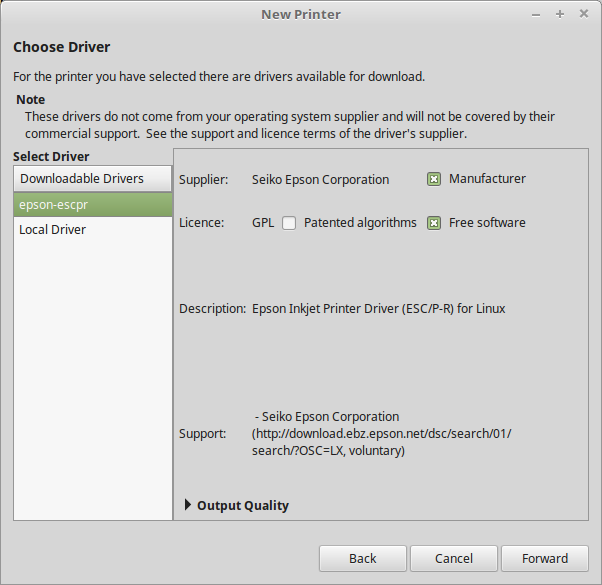 Linux Mint has a decent software manager compared to certain other Linux distributions. It looks reasonably good but more importantly, it works. To start the software manager click on the menu icon and choose the package manager icon. (it is under the firefox icon on the left side of the menu bar). The software manager has a series of categories which can be used to browse for packages. To search for games, click on games and a list of games or emulators will appear. You can also search for software using the search tool. Guess what everybody. It works!!!! 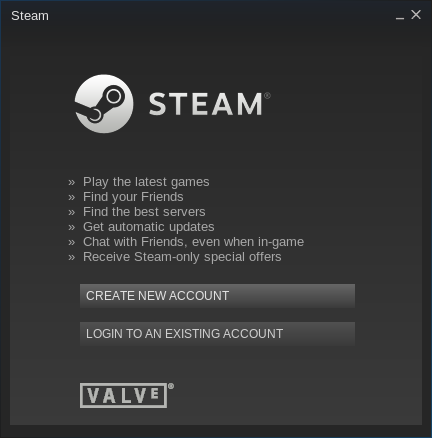 I can search for Steam and steam appears. I can search for Dropbox and Dropbox appears. I can search for Skype and Skype appears. I can search for Chrome and …. actually no it doesn’t but you do get Chromium. The next question of course is how easy is it to install the software? When I used PCLinuxOS I had significant issues with installing Steam on this very same machine. When I installed Steam on this machine this is what I got. First of all I get the option to install Steam. 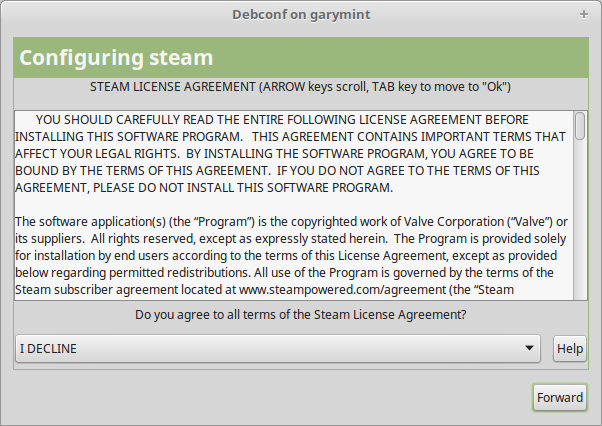 After clicking install a license agreement appears. When I accept the license agreement the Steam client installs. The Steam client then downloads what seems to be the obligatory 250 megabytes of updates. It works without any errors whatsoever. I can also confirm all the other major programs such as Dropbox, Skype etc also work fine. USB devices like my mobile phone and MP3 audio devices like a Sony Walkman are instantly available to Linux Mint and can easily be paired up with applications such as Banshee. Setting up a network printer was also incredibly easy. 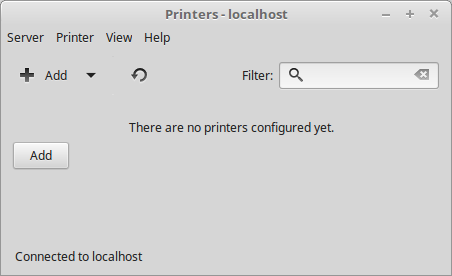 To set up a printer click on the menu, choose the administration menu and then click on printers. To add a printer click the “Add” button. 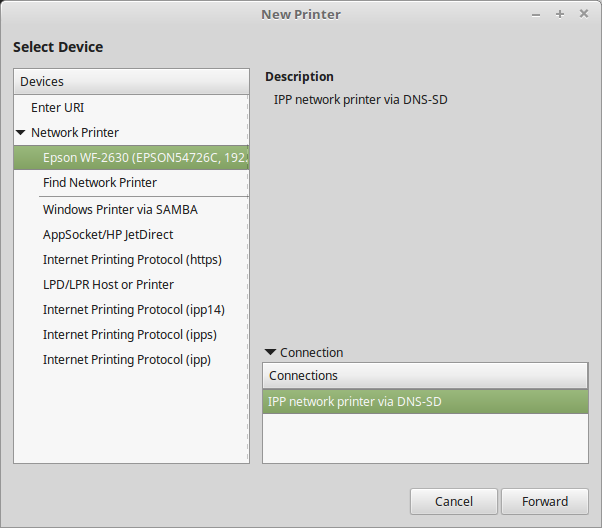 Click on the network printers option to bring up a list of options. As you can see my printer appeared straight at the top of the list. When you click on forward a search will be made for drivers for the printer. Choose the driver, click forward and that is it. I have a WDMyCloud device and it has to be said that this is possibly the worst product I have ever bought. It loses connectivity all the time whether you are using Windows, Android, Linux or anything else. However with the latest version of Linux Mint I am yet to have any issues connecting to the device. 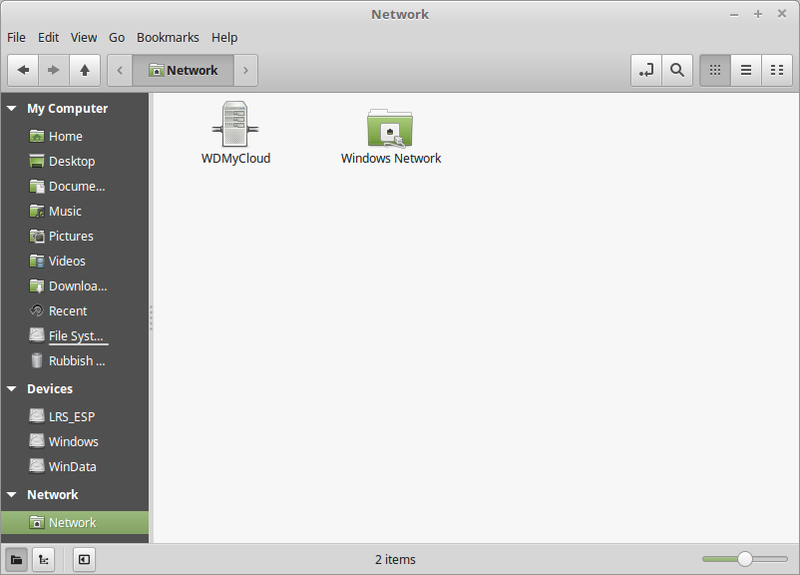 As you can see from the image above Linux Mint sees the WDMyCloud device (and believe me that is half the battle won). Clicking on the icon shows a list of all the files. Brilliant. 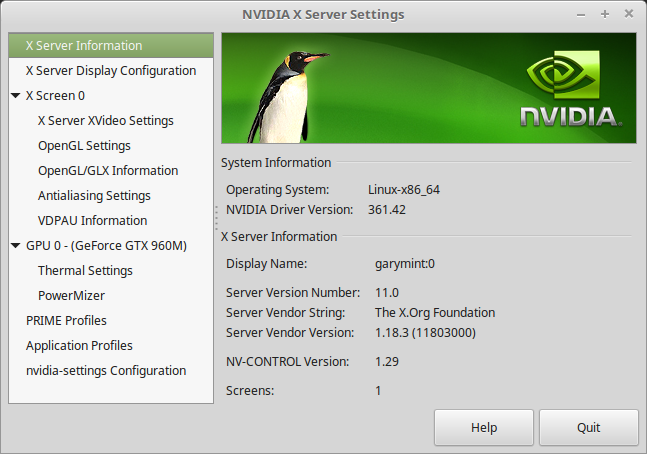 Linux Mint can do what so many other distributions and operating systems seem unable to achieve. I had the same wireless issues with Linux Mint 18 that I had with other Linux distributions and the previous version of Linux Mint on this computer. On my other computers I haven’t experienced the same issue. I managed to get the wireless working by blacklisting the ideapad_laptop module. Other than that it has been a breeze using Linux Mint. Everything pretty much works as you would expect it to. 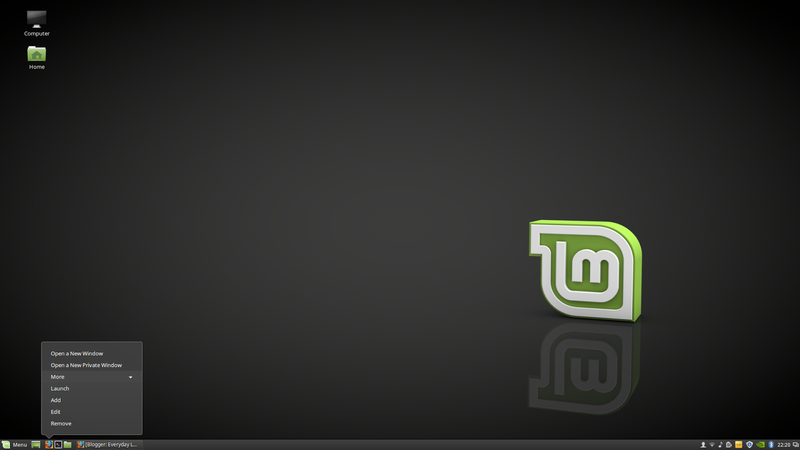 Every 2 years I fall in love with Linux Mint, which coincides with the new long term support release. Linux Mint always feels a little bit out of date by the time the 2 year cycle comes to an end. As of this moment though Linux Mint 18 is nice and fresh. The theming is absolutely brilliant, the kernel is pretty much up to date, the software all fits together nicely and the hardware works. Linux Mint is incredibly easy to use and there is no pfaffing around to jump through hoops to get software downloaded and installed (with the exception of Google Chrome). It is exceedingly easy to recommend Linux Mint to all new users of Linux and I definitely recommend it for the Everyday Linux User. The developers have done an extremely good job with this latest release. 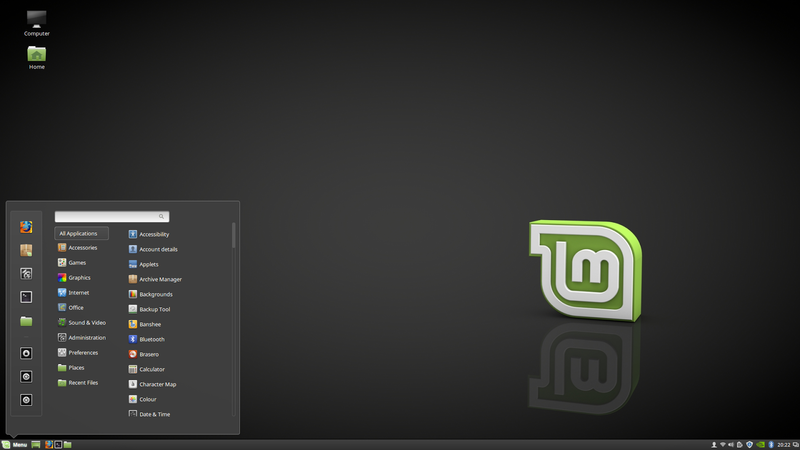 I'm also have been in love with Linux Mint it's so cool. I've been using it since version 10. I had always issues with microphone ans camera with skype( and other video messengers in Mint, but I was always able to fix these problems. But with this last one version I have been unable to fix these problem. Other than that everything works very well. Not problem at all with the wireless. Thanks for all the info you post here. Good review, but have to say I've had wireless adapter recognition issues with Mint 18 (interal Atheros, and USB Realtek) that have never been a problem before (user on three machines since Mint 15). I'm sticking with the very good Mint 17.3 until M18.1 point release, which will begin to support the new "Snap" software update technology. My suspicion – without knowing – is that Snap will do best with a fresh install to avoid glitches with current third party software configurations. I just installed Mint as I do every 2 years. I was pleasantly surprised its interface is so polished the default wallpaper and themes are better polished than MS well done it just shows what can be done with more time to polish things up. I was not happy about the scanner support PPA to get a epson scanner running then it fails because sane does not recognise the scanner it is a couple of years old and was fine till the last sane update, its not Mints fault but sane I filed a bug report months ago on this when they last upgraded so its downgrade sane+libs. Thank you for the review. Linux Mint has matured to a point where it needs no reviews :-p It gets out of the way, consumes the most minimum resources and just works. I had installed Ubuntu Xenial when it was released, but of course I had to install Mint 18 when it got released. I was finally able to get rid of windows on my asus t300chi. i tried other distros but i could never adjust the screen so i could see it without a magnifying glass. Mint 18 in "general" settings has a function to double the items size if you have HD. My crazy docking station works as well as win10 but not all function keys work. Asus stinks. you can't even find software for this docking station on their website for win10. Mint works great on this unit. I hate windows! I hate ASUS! Everything works great EXCEPT Mint backup tool, Could not get it to work on any of the version 18 flavors that i tried on my system. So far no help from the forums. Am i the only one with this issue ? No, you're not – I've had the same problem but I've just reverted to grsync, my favourite backup tool. It's available through the software manager and works absolutely fine. I can't backup my applications with it, but that's not an issue for me. Everything else works flawlessly except for an issue with the rtl8192cu wifi driver on one of my machines – now solved by installing the driver from the Realtec website. I have a slightly different opinion about Linux Mint 18. I am a long time windows user, refusing to buckle to Microsoft's bully techniques of windows 10. Die windows 10 die! I have tried several different distros looking for a replacement for windows 7. Bottom line Mint seems the best to me. I am dual boot on my Acer laptop and my FX9xxx box at home it just works. I am very impressed. Most likely in a year or two I will completely ditch windows when Microsoft gives me no more choice. Hard to give up my library of programs I have used though the years… Linux has come a long way. I still feel that Linux will never get full adoption by the masses until it gets away from the command line install issue. No normal user will be willing to do that, plus it needs stronger backing by commercial App makers. Saying that I am still uber impressed with stuff like blender open office and mints program install app that's awesome stuff! Keep up the good work MINT! Twice I tried to install Linux on different computers and it failed due to the lack of hardware drivers. I like the software however until Linux has more drivers available it is useless for "normal" people with no computer programming skills to fix driver problems. Linux has the potential to become a popular operating software, but they have to fix the drivers and make going to the command line obsolete.